Copyright © 2018 Instrument Design Technology Ltd. The stability of a monochromator is the most important factor in beamline performance. IDT have invested great effort into ensuring our range of monochromators are exceptionally stable, allowing the full potential of beamline performance to be realised. This page outlines how we approach DCM stability and demonstrates the exceptional performance achieved on the air-bearing DCM installed on GSECARS. The stability of the IDT-built GSECARS Beamline at the APS has been measured. 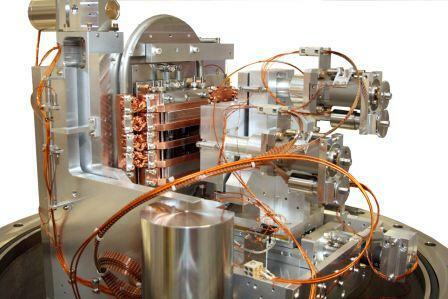 The beamline consists of a primary slit system, an air-bearing DCM and a double horizontal mirror system. The quad-diode beam position monitor, located downstream of the double mirror system, is used to measure fluoresce signal onto the top and bottom diodes to determine X-ray beam position far from source. Beam energy at 7.2 keV, no active feedback, sampling position every 0.5 sec for 500 sec. BPM vertical position is recorded and converted to an angle. 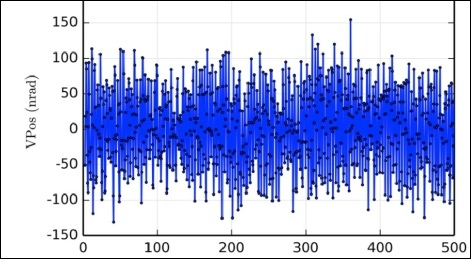 The vibrations observed are the net effect from the source, DCM and double mirror system. IDT adopt a unique thermal isolation approach in monochromator design to minimise thermal drift and maximise stability in the mechanics. Thermal drifts in monochromators can result in a dramatic loss of beam intensity and stability. The thermal stability of the mechanics is a crucial factor in the performance of any monochromator. Vibrations from water flow in cooling circuits, which are often used to thermally stabilise monochromator mechanics, can introduce further instabilities into the beam. Our approach involves thermally isolating all components subjected to temperature fluctuations (crystals, motors etc) from the monochromator mechanics, and removes the need for water stabilisation circuits or heaters. 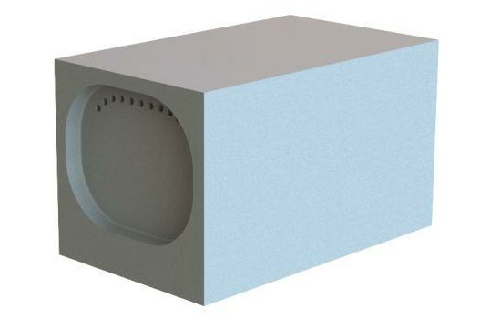 Point contacts, thermal insulators and machined thermal barriers are used throughout the monochromator design to provide multi-layer thermal isolation and offer excellent monochromator stability. A well engineered crystal cooling system is crucial to monochromator performance. Efficient cooling of the heat-loaded first crystal is essential for good optical performance. Poorly designed cooling schemes can lead to big thermal distortions of the crystals and introduce vibrational instabilities to the monochromator which can have detrimental effects on beam quality. Examples of cooling schemes which introduce large thermal gradients include indirectly back-cooled crystals and large bore directly cooled crystals. IDT monochromators feature crystal cooling schemes designed and engineered for the specific beam profile and heat load from the source of the beamline. Thorough design & FEA studies are carried out to determine the optimal cooling design for each individual monochromator. For insertion device monochromators IDT can offer vibration-free cooling using soft annealed copper couplings, giving excellent thermal conduction and zero vibration transmission. 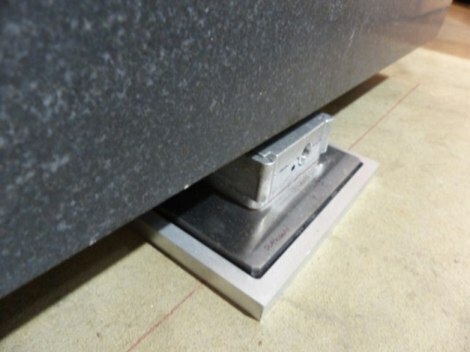 For bending magnet monochromators IDT have developed a direct water cooling system which can be adapted to the specific bending magnet beam profile. Above: Direct Water Cooled Crystal, featuring cooling hole pattern designed to match the beam profile giving optimum cooling over the entire bragg angle range. Above: Cryo-cooled first crystal assembly, featuring novel cooling design with soft annealed copper couplings connecting crystals to cryo lines giving excellent thermal conduction and zero vibration transmission from cryo lines. Minimising the transmission of vibration from motors, cooling lines and external sources to the crystals is critical to monochromator stability. Our design philosophy of low mass, high stiffness components leads to very stable devices with high natural frequencies. We have developed proven cooling schemes specifically engineered to minimise the transmission of vibrations from the cooling lines to the optic. We have also developed a proven method of isolating a monochromator from external environmental vibrations, using viscoelastic dampers in the monochromator support system. 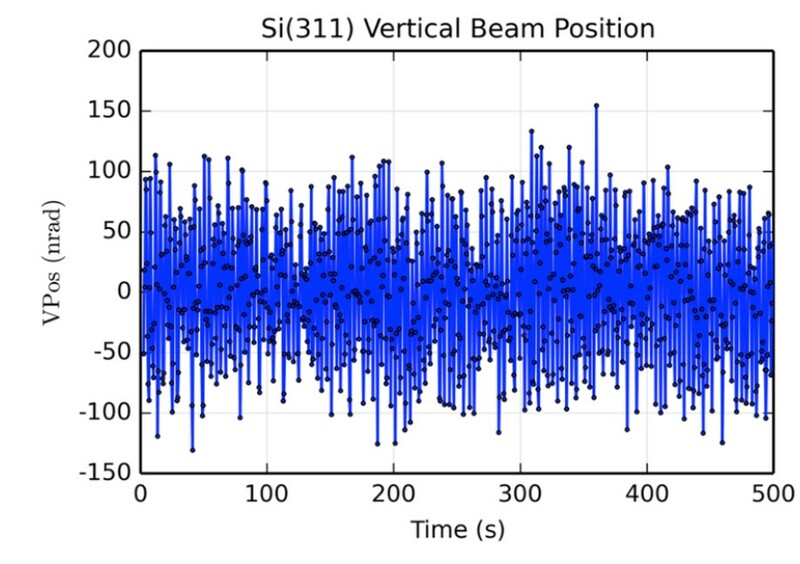 This approach has yielded a measured beamline stability of 54 nrad on GSECARS at the APS (see above).